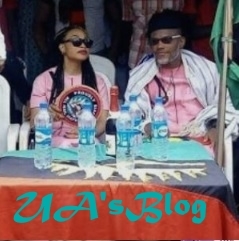 Separatist leader, Nnamdi Kanu appears to have imbibed the popular maxim that "he who fights and runs away lives to fight another day" as he reportedly maintains a low profile in Ghana. He is regularly seen at Kenzo Bar and IBG saloon in Accra, disguised in fez cap and usually in company with his wife, Uchechi. Kanu is said to live at an area called Cantonment, also in Accra, at an estate called “Arabella”.